Mission San Buenaventura, located in Ventura, was founded March 31, 1782 by Padre Junípero Serra and named for Saint Bonaventure. The first church was destroyed by the 1812 earthquake and rebuilt in 1816. San Buenaventura is ninth in the chain of missions and the last to be founded by Father Serra before his death. For the most part, San Buenaventura was a prosperous mission. Set in an area with an excellent climate and good soil, the mission fathers devised an irrigation system which provided for luxurious gardens around the area. Among the standard crops, grains and vegetables, great quantities of exotic fruits were also grown. The Chumash Indians populated the nearby villages and were friendly, artistic and industrious. Although these Indians zestfully helped with the construction of the buildings necessary to get the mission going, they never gave up their freedom and moved inside the mission walls. The mission was secularized in 1836 and in 1842 it became a parish church. 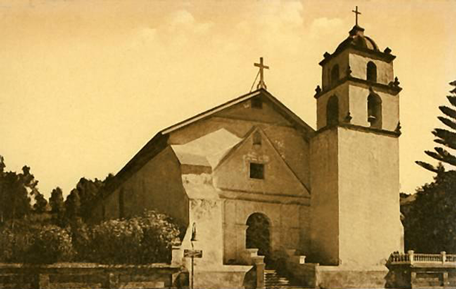 In 1845, Governor Pio Pico rented the mission which, in the end, returned to the church in 1862. In 1893, Father Cyprian Rubio "restored" the interior of the church, painting over the original interior decoration made by the Chumash Indians. New priests restored the mission in 1957. Today, a small museum can be found at the Mission with displays of Chumash Indian artifacts and items used by the priests who first settled in the area.